How does one measure psychological maturity? 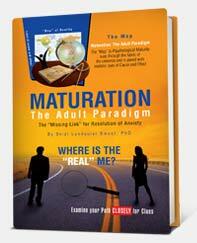 A clear boundary between adolescent and adult development has not yet been identified. In her enlightening new book, author Skipi Lundquist Smoot, PhD cites a majority of Adult Emotional Distress and Anxiety to fall on the continuum of Ego & Cognitive Immaturity/Maturity vs Neurosis/Wellness. At the heart of Psychological Immaturity lies feelings of personal inadequacy, fear of rejection and excessive dependency. We hide our “Real” selves behind “Masks” of Anxiety (attitudes and behaviors) unconsciously designed to avoid anxiety, fear of abandonment & emotional independence.